Ashtar are a superb young Brazilian band whose impressive compositions combine progressive metal with celtic influences from Scotland and elsewhere and old school progressive rock. Ashtar won the 2004 Best New Band award at the Classic Rock Society. A further mini-CD Soaring is now available from the band. Ashtar are planning to release a live DVD later this year followed by their keenly awaited new CD. Ashtar are led by talented guitarist and main songwriter Luiz Garcia (below, right) with fabulous lead signer Fernanda Gollo (left). Oswaldo Zelasso plays violin and Rob Gould, who stood in on keyboards on their last UK tour, has now become a permanent member. Their rhythm section comprises Fabio Guilherme on bass and Daniel Dobbin at the drumkit. Daniel is also a fine artist and designs most of their logos and backdrops. Their CD Urantia is one of the best debuts I have ever heard. The depth and quality of feeling in these songs reaches right to my heart in a way few others do. They embrace as wide a range of moods and feelings as I can recall from a single band, and are sung and played with rare passion by fine musicians. It was a real treat to see them and take photos in Rotherham on 15/5/2004, supporting Karnataka at the CRS (Fernanda Gollo, left; Luiz Garcia, below right). I have included captions that introduce all the band members and highlight their musical versatility. 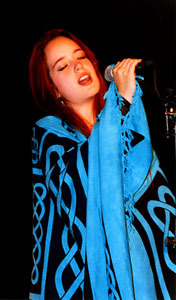 I have also taken photos on Ashtar's 2005 tour at Rotherham Rocks and Malvern, and at Bilston Robin 2 and Malvern Youth Centre in 2006. They now have a MySpace profile with the latest details from the band. Keyboard player Rob Gould also runs a great site with Ashtar photos and info, and features Ashtar on his MySpace page. You can download some Ashtar MP3s from SoundClick - have a listen youself! I run the Ashtar Fan Clan, a fans' chat group that can be accessed either as email or via the web. For rapid subscription, just click here and then send off the email. Progressive Rock & Progressive Metal - Internet Zine have several sets of Brazilian gig photos, including Circofest and Rock Symphonia.